Normal people aren’t thinking about public policy at this time of year, but I’m a libertarian who has decided to fight against big government in Washington, so I’m definitely not normal and I could be a masochist. And since you’re reading this instead of daydreaming about Santa, you’re also not part of the herd. Which means you may enjoy some good laughs with a Christmas theme. In prior years, I’ve shared IRS Christmas gifts, a video showing what would happen if Obama ran the North Pole, and presents from Ben Bernanke. This year, let’s enjoy some cartoons. 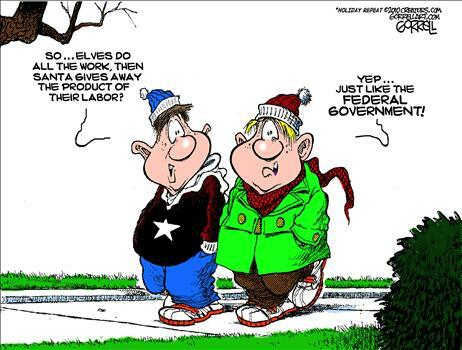 Given my disdain for big government, destructive redistribution, and high tax rates, you’ll understand why this Robert Gorrell cartoon is first on my list. Next we have Henry Payne mocking the President’s desperate efforts to get people to climb on the sinking ship of Obamacare. 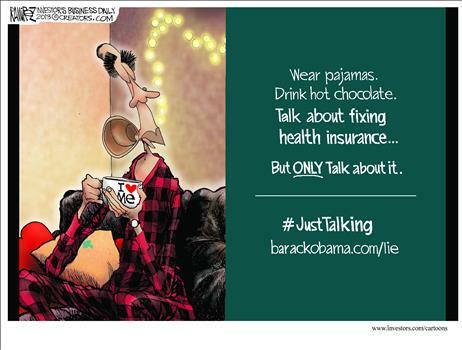 Speaking of which, here’s a gem from Michael Ramirez featuring the President in the role of Pajama Boy. But I wanted to share it because of a minor disagreement. 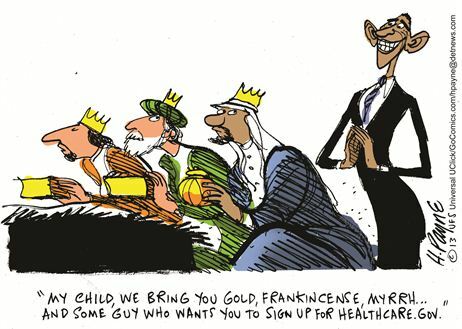 I wish Ramirez was right and Obama was “only” talking about changing health insurance. Instead, the President has taken a health care system that already was a mess because of government intervention and imposed a law that will make a bad situation far worse. Last but not least, I want to share some…um…feedback I received last night. Long-time readers may remember that I have a license plate that expresses my deep and sincere affection for Washington, DC. Well, you’ll be shocked to learn that some people disagree with me. And one of those people left a message on my windshield. 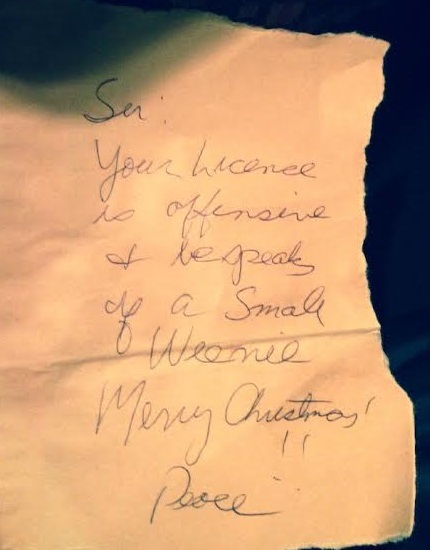 I don’t know if this “fan” was an overpaid bureaucrat, an Obama drone, a corrupt lobbyist, or a 1960s refugee, but you can see that he (could be a she, I suppose, but the handwriting seems male) was irked. A few thoughts about the message. 1. Why is my license plate offensive? Were the Founding Fathers also offensive because of their distrust of centralized power and authority? That certainly seems to be Obama’s view, so maybe my “fan” is an Obama drone. 2. Then again, the use of “bespeaks” suggests someone who spent too much time in college. So maybe this is a former grad student who became a Hill staffer and is now a sleazy lobbyist for some unethical group of moochers. No wonder he’s angry about life. 3. Regarding the…er…challenge to my manhood, it was actually my girlfriend who found the message. 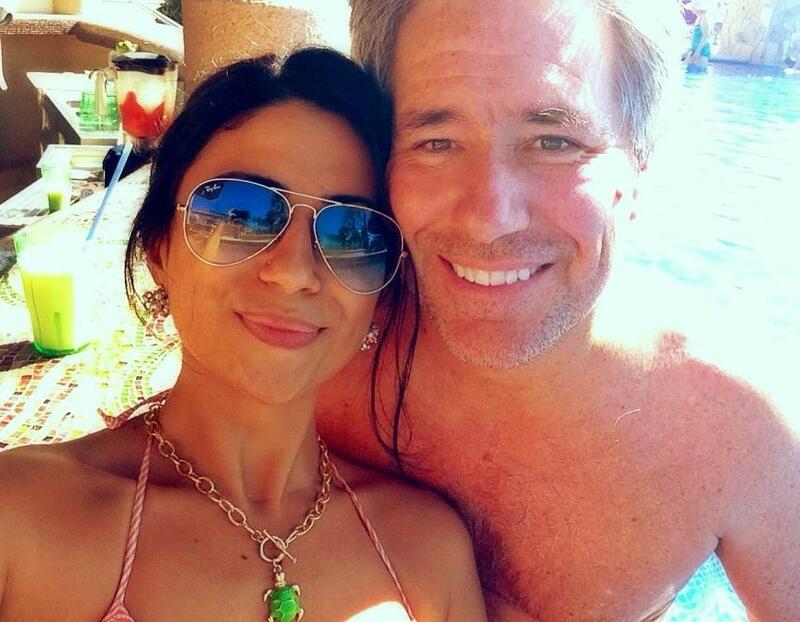 And since she’s way too hot for me, I must have some redeeming quality. At least I hope. 4. I’m surprised that my new friend wrote “Merry Christmas.” Isn’t that politically incorrect?!? What if I was Jewish? Or Muslim? Or Buddhist? Or whatever? This makes me think the author was an overpaid bureaucrat who slept through his mandatory sensitivity training. European Union bureaucrats surely would never make this mistake. 5. Last but not least, I’m amused that a statist would use “Peace” as a valediction. It is the left that believes in using the coercive power of government – ultimately enforced by threats and violence – to restrict the rights of others. So maybe my “fan” is a 1960s leftover. These are the nitwits, after all, who protest against government by demanding more government. Maybe the guy who left the note is a reader and will reveal his identity, but I won’t hold my breath. In the meantime, enjoy a politically incorrect Christmas story from Larry the Cable Guy. ““I was bored, lonely, new to New York, my body and myself. I went to a bad state school, got mediocre grades, looked totally average, did nothing special. I’d had boyfriends before, anonymous guys with anonymous names and dim futures, but none of my friends ever tried to date them, not because they liked me but because they weren’t attractive – not even to me, and I have low standards. and this fellow is a standard bearer for progressive politics… him and pajama boy……………….. ewww………. Is the opening volley for a government sponsored “Weenie Equalization” project? Merry Christmas to all, even “Peace”! you have to wonder…………………. why the statists are worried about the size of the libertarian “weenie”………………………. Uh oh! We’re starting to have serious girlfriend inequality problems in America. Watch out Mr. Mitchell, you may be a minority, and redistribution to a fairer love life for all may just be around the corner. “From each according to desirability, to each according to libido”. In fashion typical of those of you who peddle oversimplified and overly zealous partisan zeal, you have evaded/avoided the writer’s central assertion. If you are going to respond with intellectual honesty you must answer the charge: Do you or do you not have a small weenie?